Living through the booms and busts in a West Texas oil town. Back when just about every oil pump jack in town was running, Tara Smith had more work than she could handle. The West Texas native ran her own company, Dirty Ride Mobile Wash, going out into the oil fields to clean muddy tank trucks. With oil booming, she was booked day and night. Demand for her services was so high that Smith invested in two additional pickups and a pair of industrial steamers just to keep up. Her team stretched to eight workers, several of them single mothers. They could each pull down $1,400 a week if they hustled. Then the price of oil took a nosedive in 2014. A surge in global supply ― much of it driven by the boom in shale extraction in the U.S. ― coupled with a dropoff in demand sent the price of a barrel of oil tumbling. Almost overnight, Smith’s biggest customers pulled their trucks from the field and vanished. Strapped for cash, even some of her long-term customers opted to clean their own cars and pickups to save money. Smith had to lay off most of her crew and send two trucks back to the dealer. The crash hit her husband, Ray Smith, just as hard. He lost a well-paying job as an oil-field diesel mechanic. He ended up scrapping iron, mowing lawns and working a $9-an-hour job at AutoZone just to meet their mortgage payment. Tara Smith washes an oil tank truck in a yard west of Odessa. Tara and Ray had been kids the last time Odessa went through a bust, during the oil glut of the 1980s. Although the city would recover much quicker this time, the Smiths’ story is a reminder that booms and busts are as much an Odessa birthright as Friday night football games. 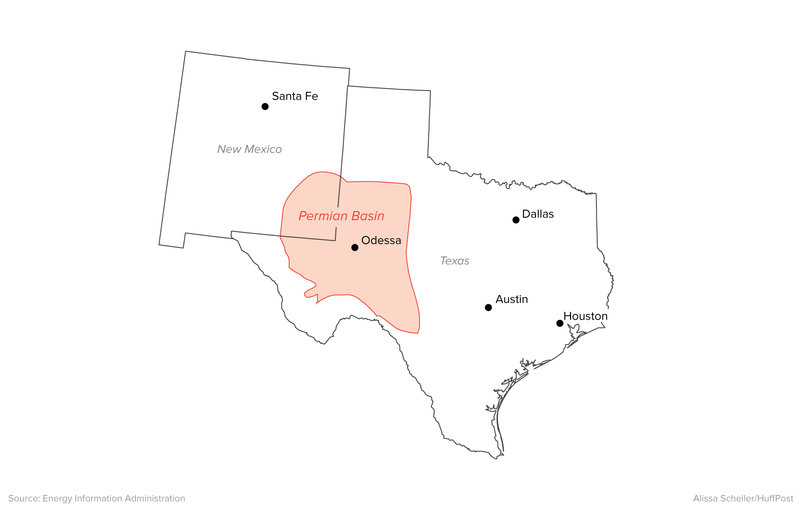 The city sits upon the Permian Basin, historically one of the most productive oil basins in the country. For better or worse, most of the work here is tied somehow to the oil industry. Though mostly a blessing, the Permian’s vast pools of oil can sometimes seem like a curse ― and not just when oil prices tank. During the booms, Odessa floods with workers from throughout Texas and beyond, taxing the city’s infrastructure. Drive down any road and your car will find a pothole. Search for a place to live and you’ll find the price of rent has skyrocketed, with RV hookups and unfinished garages running for as much as $1,000 a month. The high-paying jobs in the field also sap workers from other professions, leading to shortages of teachers and other civil servants. And the ups and downs lead to wild swings in tax revenue, leaving the city unsure how it will fund schools. “It’s frankly the most economically interesting area in the world,” Karr Ingham, an Amarillo-based economist who studies metro areas, said of Odessa. “When crude oil prices go up or down, it takes the general economy with it, because it is the general economy. Things seemingly unconnected to oil and gas ― automotive dealers, restaurants, virtually every business in town ― are driven by what goes on in oil and gas. Ray Smith and his wife, Tara, hook up a hose at a water distributing station to fill their pressure-washer tank. Even though the price of crude oil is still hovering around $50 a barrel ― roughly half of its high in 2014 ― Odessa once again appears to be on the upswing. That’s because the Permian Basin enjoys certain advantages over other, less resilient oil-producing regions, like the Bakken Formation in North Dakota. The Permian’s oil industry is so long-established that much of the pipeline and other necessary infrastructure is already there. And the basin’s geological formations ― sometimes referred to as an oil-soaked layer cake ― make extraction a better return on investment than in other areas, particularly with advancements in fracking and horizontal drilling. The Permian’s “break-even” point ― the price above which drilling for oil can turn a profit ― is the lowest in the country, according to recent estimates. 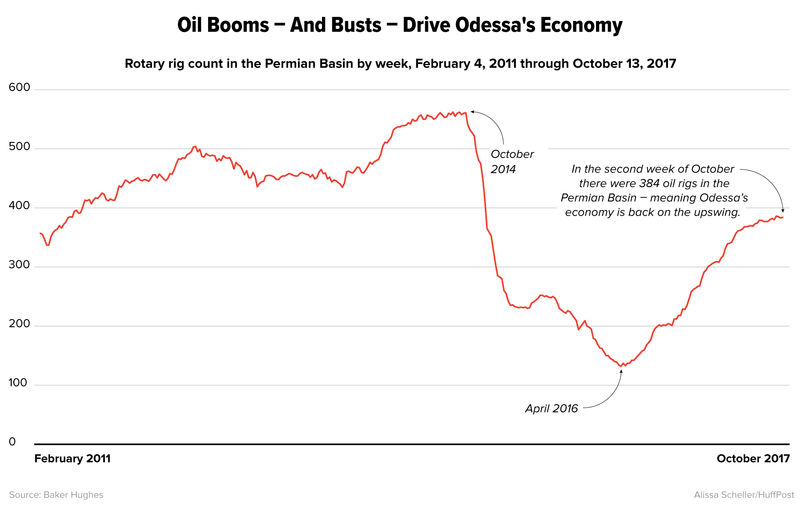 So while the area isn’t humming the way it did with oil above $100 a barrel, drilling around Odessa makes plenty of economic sense right now. The number of active oil rigs in the Permian Basin has nearly tripled over the last year and a half, and it continues to increase each month. In the four years they have been in business, Jesse Murillo and Megan Newman have experienced the tail end of a boom, a painful bust and the start of yet another boom. After oil prices collapsed, the couple’s Out West RV park sat empty but for one customer. There was even a problem in Odessa and nearby Midland with RVs being abandoned during the downturn. But now Murillo and Newman are fully booked again and have to turn away workers coming into town. They have their own measure for gauging the health of the Odessa economy: the length of the lines at Red Lobster and Hooters. With Odessa on the cusp of another boom, city and county leaders are bracing for the challenges that come with it ― like how to maintain basic public services and retain employees like Jonathan Duran. Duran, a county jailer, remembers hearing about the huge amounts of money people were making during the last boom. He decided to leave his steady job at the Ector County Detention Center to chase a hefty paycheck in the oil field. As the oil industry started to slide in 2014 and everyone’s hours were getting cut, Duran recalled going in to work at 6 or 7 a.m. and being sent home by 2 p.m. Before long he had to decide which bill to pay first and struggled to make sure his child had enough money for school lunches. When his company started laying people off, Duran’s boss asked him to stick around and help him choose who to send home. Duran decided to give up his job so that someone else could stay. He had a backup plan, anyway ― returning to work at the jail, where he remains today. Jonathan Duran returned to work as a jailer at the Ector County Detention Center in Odessa. It's a steadier job than oil field work. Ector County Sheriff Mike Griffis said it’s hard for a public agency to compete with some of the oil field salaries. While the county offers good benefits, a lot of younger employees aren’t interested in that, he said. They want to know what their paycheck is going to be on Friday. In 2010, the Odessa Police Department was fully staffed, but as oil boomed in 2012, they became shorthanded. The department wasn’t able to reach its target staffing levels again until the summer of 2016, OPD spokesman Sgt. Steve LeSueur said. The fluctuations of the oil field bring other problems for law enforcement and the community. Kevin Thompson, who works for the Permian Basin Regional Council on Alcohol and Drug Abuse, said the number of drug seizures has moved more or less in sync with the local oil rig count. After dipping from 2014 to 2016, “it’s starting to pick back up again,” he said. Cocaine and methamphetamine, in particular, have become a crutch for oil workers logging brutal hours during the boom times. Just as police face more calls for service, the schools face crowded classrooms and a dearth of teachers. 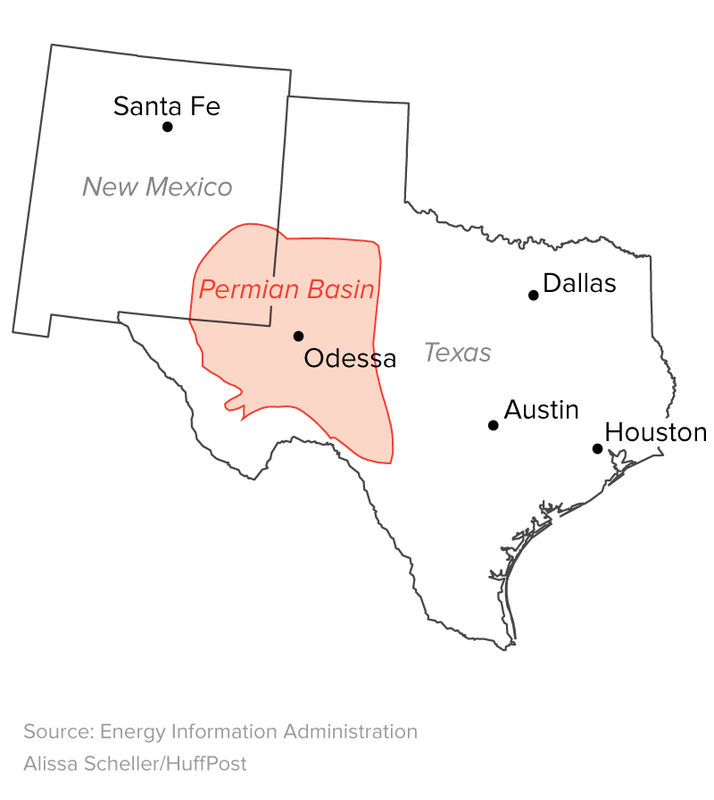 Ray Perryman, an Odessa resident and economist, said energy upswings draw more families to the area while drawing more local teachers to the oil fields ― some of whom will not return. While school enrollment may fall with another drop in the oil industry, that wasn’t the case during the most recent downturn, Perryman said. The county’s two public high schools, Odessa and Permian, are expected to have more students enrolled this year than the buildings’ maximum capacity would allow. With the city still in recovery mode from the last oil bust, elected officials have turned to increasing property taxes, placing a larger burden on taxpayers’ shoulders than some would like. All five local taxing entities voted to raise them this year. 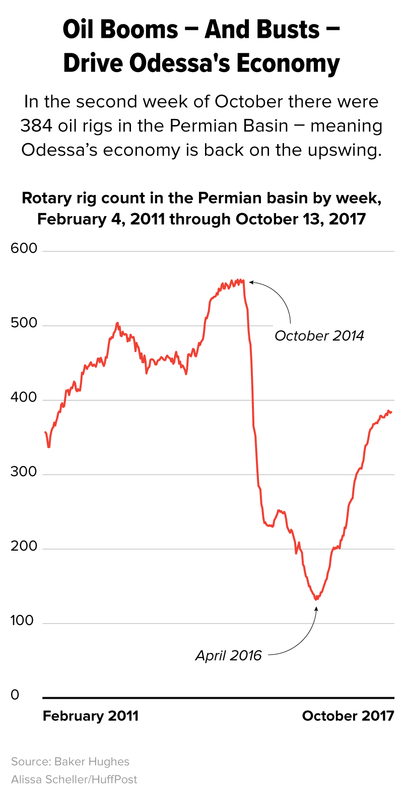 Pump jacks are dipping into the Permian Basin again as crude prices recover. David Simpson says Odessa is better equipped to handle the ups and downs than it used to be. He runs the downtown clothing store his father founded in 1973, Jim’s Tall & Big Men’s Shop. Unlike when his dad started out, the area has diversified its energy sector, branching out into wind and solar and natural gas. Tara and Ray Smith see another boom on the horizon. It’s been three years since the mobile wash was booked steady, but Tara has noticed that the service fleets that sat idle last year are moving again and getting caked in dirt. Ray now works full time cleaning trucks, while Tara spends most of her time watching their 6-month-old son. They have no need for a crew at the moment, but they know that could change quickly. On a recent Friday night, the couple were in the middle of cleaning an oil tank truck in an RV lot on the side of the interstate, rain falling in a steady drizzle. It was nearly 10 p.m., and they still had hours more work ahead of them. They reflected on some of the mistakes they made during the previous boom: They wouldn’t invest in new trucks again, instead working with what they already have or buying used. And when the money comes pouring in, they’ll remember that during the bust they had to work with the bank just to keep their home.